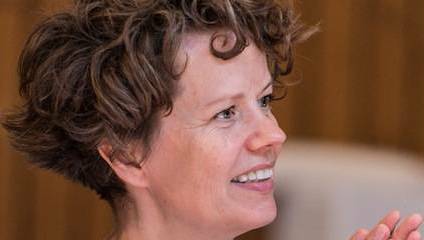 Sally Cookson is a theatre-maker whose career creating theatre for youngsters has led to a primetime Christmas show at the National Theatre and a UK tour for her acclaimed adaptation of Jane Eyre. Her idiosyncratic style blends music with a collective sense of play and a love of storytelling. She returns to early years theatre with a revival of Tiddler and Other Terrific Tales, which opens at the Leicester Square Theatre on July 13. London Calling: Hi Sally, thanks very much for speaking to us! Please could you start by telling us a bit about Tiddler & Other Terrific Tales? Sally Cookson: Tiddler is a series of popular children’s books by Julia Donaldson that we have adapted for the stage. We tell several stories including Tiddler, Monkey, The Smartest Giant in Town and A Squash and a Squeeze. It’s an early-years show with three performers who are very clown-like and have a delightful engagement with the audience right from the start. The whole piece is a celebration of playing; we invite the audience into an imaginary world. Monkey is made out of ropes, an elephant is made out of an old washing machine vent with big bags for ears and the cast create an entire world using props. The actors telling these stories are very mischievous – they have real twinkles in their eyes – and are very playful with each other and the audience. The stories are weaved together with beautiful music by Benji Bower, and the actors all play instruments. LC: What drew you to Tiddler? What do you look for in an adaptation? SC: Julia Donaldson has a knack of really getting the text in her stories right. Most of her stories are written in verse, and I love working with stories that have a sense of rhythm because it lends itself so well to embellishment with music. They’re fun stories with quirky characters, and they capture a real playfulness – which I love when I’m making work. LC: Your other work has been very much a collaborative effort – has this been the same? What do you enjoy about devising in a group? SC: When we made this show we devised it together in the room, and we made collective decisions about how to interpret these stories. I’m always looking for actors who have massive imaginations and are ready to do that. Every time it’s remounted with a new cast the show shifts slightly to change with those new actors, so it maintains a sense of ownership. I create work with the actors, and nothing is scripted before we start rehearsals; it’s the same with the music. I think there’s nothing more exciting than not knowing where you’re going to end up at the start of rehearsals. In my prep I’ll have ideas, but invariably those ideas get thrown out. We have better ones by working together – things happen that you could never imagine when you’re working in a creative room. Being in a room with people who all have different ideas of how to tell a story is a very exciting way of working. It’s my favourite way of working. LC: Are you enjoying working in a smaller space than a lot of your more recent shows? SC: Absolutely – after I’ve done a massive piece it’s always a delight to revisit a small-scale show. I’ve missed early years work – it’s how I really honed my craft as a director. When I was travelling light for ten years in the nineties I worked specifically with early years audiences and it was a really important part of my time as a director. LC: What was it about those years spent in early years theatre that informed your practice now? SC: The biggest thing was not feeling I had to rely on text all the time. If you just rely on text - especially with very young children – they disengage. Visual storytelling is very important for that age group, and that is something I use in adult work now. Finding a visual way to tell stories is one of the biggest things I’ve learnt. LC: How important is music in your shows? SC: It’s always been crucial actually. Music for me helps tell a story. It’s not just background and it doesn’t just link scenes. Music allows an audience to understand a character’s emotional state, and really taps into the imaginative world of a story. I rely very heavily on music, and I’ve collaborated with Benji for a long time. We have a great understanding, and his work on Tiddler is delightful. LC: Do you have any other stories you’d love to work on? SC: I do, and I am. I’m just about to go into prep for The Lion, The Witch and The Wardrobe which I’m doing at the West Yorkshire Playhouse this Christmas and next year I’m going to be doing another big story which I can’t reveal yet. It’s a story that I love very much, and it’s a book for young adults. LC: Ooh, I hope it’s the one I’m thinking of! What else is on your cultural radar at the moment? SC: I love watching dance – I’m sort of obsessed with it at the moment. I recently saw the most inspiring show called Betroffenheit, by a Canadian dance company called Electric Theatre, which has been a massive inspiration. Keith Jarrett is an amazing pianist – I listen to him whenever I need unlocking. I’m actually listening to Hamilton too. My daughter is obsessed with it so I thought I’d better find out what it’s all about, and Imogen Heap is another artist I’m listening to a lot of right now. The Marx Brothers, Charlie Chaplin and Buster Keaton are also big inspirations for me. Tiddler and Other Terrific Tales is at Leicester Square Theatre until September 3. Tickets are £19.50 for adults, £14.50 for kids and a family ticket is £60.